In this week’s episode hosts Kristine D’Arbelles and Julia Kent talk about how a listener of the show went from podcast listener to career star. We tell you Sharon Cheung‘s story. Some of you might recognize Sharon’s name. This is not the first time she is mentioned on Young PR Pros. Sharon was the mastermind behind our popular Take uOPRA to Work series in 2013. The series followed four professionals in different PR and communication roles and industries to help new and returning students to the University of Ottawa understand the opportunities available to them after graduation. The series even won a local IABC Ottawa Excel Award in 2014. Now Sharon works with Kristine at the Canadian Automobile Association. Kristine sits down with Sharon and asks her questions about the interview process. What did she do to put together a compelling resume and cover letter? What did she do to prepare for the interview? What did she include in her portfolio? This episode is about a real success story. 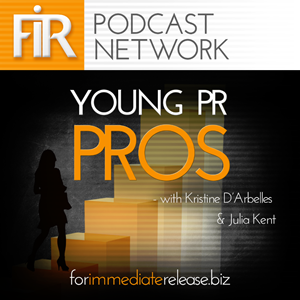 Sharon offers excellent advice on how she went from Young PR Pros listener to career starter. We want to hear from you! Do you have a success story to tell? Don’t be shy, your experience and advice could help other listeners!